Aside from all the speculation about the trajectory of Donald Trump’s and Ben Carson’s and Marco Rubio’s presidential campaigns, the big question is whether the appropriate model for understanding Jeb Bush’s candidacy is McCain ’08 or Walker ’16. It’s pretty obvious which model the Jebster’s people would prefer: the one in which their candidate gets to play the slow-but-steady McCain focused on his best state (New Hampshire) even as flashier candidates like Rudy Guiliani and Mitt Romney beat him up in the early polls. The differences between McCain ’08 and Jeb! ’16 are actually pretty striking: McCain never did lose a residual level of popularity with Republicans; his problem was money, the one thing (along with persistently terrible favorability ratios) Bush actually has, at least in his Super-PAC account. What Jeb does share with McCain is a theoretically feasible if basically implausible “path to the nomination” that involves all the other candidates damaging each other before self-destructing. This worked out for McCain, and you can agree with political scientists who think it’s because Party Elites started backing him as the deal went down, or agree with me that he was the luckiest man alive, at least until he rolled the dice on a running-mate. With Jeb not doing that well on elite endorsements outside Florida, and with an even bigger field than McCain had to deal with, it’s not clear the ’08 path is really open to Bush without a bunch of stuff happening that he has no control over (unless he’s sitting on some hitherto unrevealed dirt on Rubio). The Walker ’16 model for what’s happening next to Jeb is, however, becoming more credible each day. That would involve a series of bad polls and underwhelming debate appearances that eventually dry up the wellsprings of money. [T]he Bay News 9/News 13 Florida Decides Poll… found Bush in a staggeringly weak position back home. Bush won the support of only 7 percent of Florida GOP primary voters in the automated SurveyUSA poll of a state where he had won two elections and narrowly lost a third. He was 30 points behind front-runner Donald Trump (also a Florida resident, part-time). He had less than half the support of Sen. Marco Rubio (R-Fla.). In almost every demographic breakdown, he staggered into fifth place. His best demographic? Non-Cuban Hispanic voters. 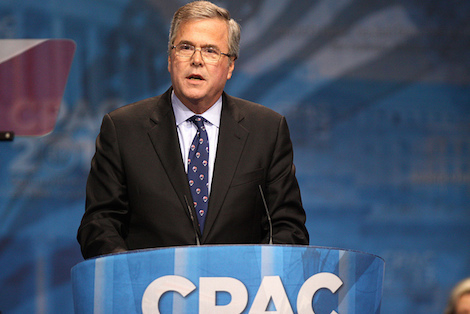 Donald Trump was their first choice; Jeb Bush was their third…. [A] candidate of Bush’s stature — an establishment favorite, the race’s fundraising leader — rarely bombs like this. In 2012, there were very few polls of the Massachusetts presidential primary, but former governor Mitt Romney led them by an average of 46 points. In 2008, even before he won the Iowa caucuses (i.e. in the period when then-New York Sen. Hillary Clinton was the national poll leader), then-Sen. Barack Obama always held leads in Illinois. Today’s news brings a terrible national poll for Jeb: Quinnipiac, which has him in a distant fifth place at 4% (down from 10% in September). With Chris Christie enjoying a bit of a resurgence, Jeb is also the only candidate outside the debate undercard bottom-feeders with an net negative approval ratio (44/47) among Republicans. Compare that to the ratios for Carson (82/6), Rubio (71/10), Cruz (68/9) and even Trump (63/30), and it’s not surprising the Quinnipiac people didn’t even bother to include Bush in the general election trial heats. If this is, as Tim Miller predicted, just the beginning of a few weeks of bad polls, with under three months to go until the Iowa Caucuses, you have to wonder how Team Jeb will avoid the Walker Syndrome. It probably doesn’t help that he’s chosen a slogan for his “rebooted” campaign–Jeb Can Fix This–that’s all too easy for us media types to apply sarcastically to his own candidacy. He really needs a break, but it’s not clear he can buy one.